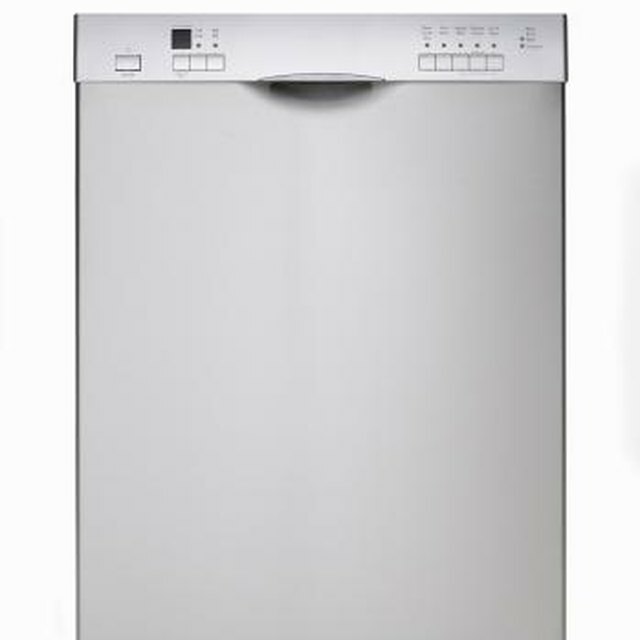 The Kenmore Ultra Wash Quiet Guard Deluxe is a dishwasher that is designed to operate quietly and features an ultra flow water feed tube, upper and lower spray arms, a rinse aid dispenser and an electronic control panel. All features aside, however, if the dishwasher does not drain, owners might want to try some troubleshooting techniques. If the Kenmore Ultra Quiet dishwasher was stopped mid-cycle to add a dish or for another reason and was not restarted to resume and finish the cycle, there may be water left in the tub, which does not indicate a drain problem with the dishwasher. Select a "Drain" cycle to drain any remaining water from the dishwasher and allow the full cycle to complete before stopping the dishwasher. Many kitchens have a garbage disposal connected to the kitchen sink. While at first this may seem as though it has nothing to do with the dishwasher, the two are actually connected. Run some water into the sink, and start the garbage disposal to clean out the kitchen drain, which will also help clear the dishwasher drain. Take a look below the sink, and ensure the knockout plug between the dishwasher and the garbage disposal was removed during installation. If left in place, this blocks water from draining correctly. Turn off and disconnect the power to the Kenmore dishwasher, and find the drain hose that is connected to the dishwasher. Remove the drain hose, and look inside for objects or debris that might be blocking the hose. Clean it out, and disconnect the end of the hose from the dishwasher itself. Clean out the inlet screen on the inside of the hose as well as in the dishwasher. When the drain hose is reconnected, ensure the hose is straight and not bent as this can also cause drain problems. If the kitchen sink has an air gap installed, this may also be the source of the problem. Lift off the air gap top, and flush out the hoses inside. The drain line inside the air gap is often connected to the garbage disposal or the kitchen drain, so clearing it out can improve the dishwasher drain. In the bottom of the dishwasher is a drain valve, which may get stuck and prevent proper drainage. The impeller, which looks like a round fan, can also get stuck and fail. Access these parts by removing the lower rack and the spray arm. Clean the impeller, and remove any debris that may be causing the problem. If the impeller or the drain valve appear to be broken or damaged, repair assistance will most likely be necessary.